The cold front storming through the Midwest is projected to hit New England in time for Wednesday’s evening commute. 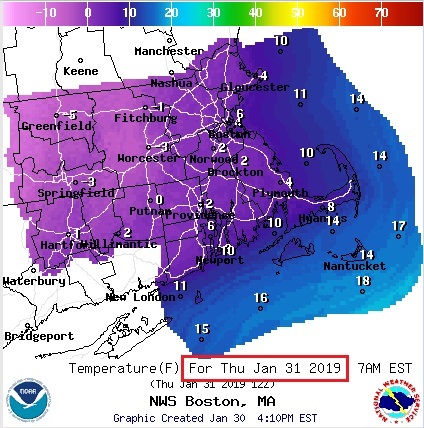 After a stretch of moderately cold weather, temperatures are set to plummet into the single digits for the next two days, with wind chills sinking below zero. The National Weather Service has issued a wind chill advisory lasting through Thursday morning, and could hit -11 degrees. Along with the cold temperatures, a brief, but intense snow squalls could snarl traffic Wednesday. Winds could hover between 30 and 40 miles per hour, with the possibility of gusts reaching upwards of 50 miles per hour. Simpson said the cold snap is the result of arctic air moving south, what’s been referred to as a polar vortex. Temperatures will likely remain well below freezing, before warming back up into the 30s and 40s this weekend.